>> Why Policy Management Software in SharePoint? Why Policy Management Software in SharePoint? As part of an on-going series of posts illustrating how SharePoint can help manage the life-cycle of a policy, this post introduces at a high-level the features SharePoint has on offer. 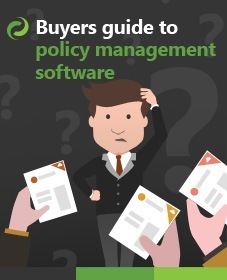 To view a list of the required features for a policy management system, please look (and contribute) at “The Ultimate Buyers Guide To Policy Management Software” and “Benefits of using SharePoint to manage policies and procedures“on List.ly. In this post I wanted to go over some of the main reasons why organizations need Policy Management Software in SharePoint and why using SharePoint and DocRead to manage your policy compliance is the obvious choice. For as long as companies have existed, they have been regulated by governments, councils, watchdogs, regulatory bodies, shareholders and acts of law to name but a few. For many reasons including the current global economic crisis, increasing global trade and even the introduction of the internet has meant the regulatory burden on organizations is now heavier than ever. Where organizations don’t comply, it’s common practice for large fines or even prison sentences for owners and / or employees to be received. A recent example of a large fine in the UK was when the FSA fined Willis Limited 7 million pounds for non-compliance of the Bribery Act. How to create, maintain, version and publish policies. How do distribute the correct policies to the correct groups of employees. How to track who has read the policies and, sometimes more importantly, who has not. How to audit and prove who has read what policy and which version. Why consider using SharePoint for your policy management? SharePoint is now used in 79% of Fortune 500 companies. It is Microsoft’s fastest selling server product ever. It now generates 2 billion dollars worth of revenue and if it was a company would be in the top 10 of the world’s largest. Very impressive stats! SharePoint is used for document management more than anything else. Organizations are either in the process of moving their documents to SharePoint, or have already done so. If your organizations documents are already in SharePoint, why learn, train on and pay for another external document and content management system? The beauty of using SharePoint for policy management is that you can use all of the tools that you are familiar with and extend it in virtually unlimited ways. Versioning – in the traditional file-system, there is no versioning. Someone saves a file – they overwrite it. The only way around this is to make copies and name them v2, v3 and so on. This leads to thousands of dead documents. SharePoint has version management built in making it really easy to see changes and revert to previous versions if required. Collaboration – SharePoint makes collaboration very easy when working on Policies. It’s simple to create a new site specifically for authoring a new policy. The new site can contain discussion forums, task boards, meeting minutes and calendars along with a host of other SharePoint features ready to help you get the policy authored and published. Approval Workflows – These allow key individuals in your organization to approve the policy. Workflows can be simple, 2 stage or as complex as you require. Auditing – Once activated SharePoint auditing can track key events and interactions with your policy, again helping in your compliance efforts. Tagging and metadata – It’s now common practice to ‘tag’ documents to give them meaning. This really helps documents to be organised and located. In the old file-system approach documents had to be stored in folders. Once a document was ‘pigeon-holed’ into a folder it meant that the user looking for the document needed to know the filing system in use. Nearly all documents can be filed into at least 2 folders (e.g. Finance and Policies). Tagging and metadata give this flexibility. Search and discovery – Search in SharePoint allows documents to be located very quickly. Search can be refined by your organization to make it fit exactly how you wish it to work. Accessibility – SharePoint can be configured to be accessible by third parties or partners via an Extranet, meaning your policies can be assigned to others outside of your organization. It can even be configured to be accessed by internet-based users. These approaches make it possible for the correct people to see the correct documents. Security – If you don’t want certain people to view, edit or delete a document, then this is a breeze in SharePoint. Publishing. SharePoint has some amazing features to allow different types of content to be published and circulated. 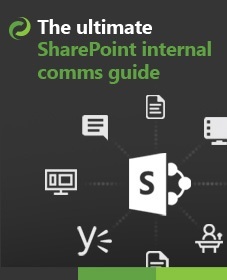 This can include, video, audio, office docs and even content editable pages within SharePoint. All of this can be indexed and found easily by your staff. These are just some of the fantastic features that SharePoint gives you and are some of the major reasons why nearly all organizations have moved to SharePoint as a document management system. However, SharePoint is missing some key features to make it viable as a way to fully manage, track and distribute policies. It has all of the authoring and collaboration features, but falls short of the distribution and tracking side. This is why we built DocRead and why we have many happy customers using it today. One of the major requirements we set ourselves with DocRead was to integrate seamlessly into SharePoint. We wanted to make a product that Microsoft themselves would have made – had they had time. Our customers have told us we have it spot-on. The lines between where SharePoint ends and DocRead starts are very blurred. This is something we are really proud of! DocRead took many years to build – we never rushed it, we haven’t piled it high with features, we concentrated on crafting a product with performance, security and ease of use in mind. We knew as our customers used it they would be instrumental in driving it’s direction. A perfect illustration of this is the up and coming quiz module which will be released by the end of the year. DocRead is a SharePoint add-on that can used to distribute any document in any format (Word, Excel, PDF, web page, etc), to any group of employees and track that they have read it. It just so happens that the majority of our customers use it to distribute policies as they are usually the ones that need tracking and acknowledging. DocRead works by allowing a policy publisher to specify one or many groups to send a policy to. They must also specify the number of days a user has to read the policy. Once published and approved, DocRead takes care of the rest. Through a series of background jobs we create each person in the group a ‘reading task’ and set them a deadline to acknowledge and agree to the policy. Emails are sent and web parts can be placed on any web page to ensure that there are no excuses! Obviously, there are situations where employees don’t read documents and these are sometimes the things that are of most interest to organizations. After all non-compliance is the reason for those fines! This is simply solved by using DocRead Reports which are built into SharePoint and allow administrators to concentrate their efforts on those employees whose tasks are overdue. What’s the killer feature in DocRead? There are many features we are really proud of. Some would say that DocRead’s ability to work on documents already managed in SharePoint is the killer. Some would say that the ability to place a reading list web part on any page in any site and see your reading in one place is the killer. However, during a recent demonstration, it dawned on us that we have been underselling our ‘killer feature’. It’s something we take for granted, but it’s also something that offers such power and a high degree of automation. That feature is ‘Smart Move‘. Smart Move means that once you assign a document to group with DocRead, DocRead will then take care of dynamically assigning reading task to the members of the group for as long as it’s assigned. This means if you have a ‘New Starters’ group – once a user gets put into that group, DocRead will intelligently decide that they haven’t read key documents and will create reading tasks for them with a deadline. Likewise, if a user leaves the group then DocRead will remove the reading task and issue a negative receipt recording the fact that they never read the document. Read more on Smart Move. If you currently use email, paper and phone calls to distribute and track reports DocRead will save you money in days. If your policies are stored in SharePoint then in no time at all you can start distributing them to groups of employees. All our customer feedback leads to the fact that DocRead is also extremely easy for end-users to use and requires minimal training. If you currently use different policy management software outside of SharePoint and are forced to store documents in two places then we believe that DocRead is so competitively priced that you will still be able to save money by moving to DocRead in SharePoint. This means you can – at last – have one document system not two! If you are worried about the history – we can also help you migrate documents and history from older systems. If DocRead is something you would like to know more about then give us a call or drop us an email at sales@collaboris.com. We can also put you in contact with some of our customers so you get the real view of what they think! If you want to find out more about DocRead – why not take the tour ?